Festive and colorful weddings always brighten our day here at Junebug, and we’re hoping Kelly and Tim’s wedding will bring you a little joy too! Rich, warm florals, a romantic wedding arch, and a fun chocolate dessert all came together to created this wonderful wedding at Ashley Inn at Meadow Lake Equestrian Center. The sunny day created a glow around the couple as they exchanged vows, and Goldie & Christine Photography was there to capture ever minute of this heart-warming wedding! From the bride: We really wanted our wedding to feel more like a party, nothing too stuffy or formal. We also really wanted our personality to shine through our wedding. We wanted special details that were very “us” so that our family,friends, and other guests got an idea of who Tim and I are as a couple even if they didn’t know one of us that well. I drew a lot of inspiration from where I work, I am a manager at Anthropologie. It is a very creative and whimsical company that sells home items and women’s apparel. 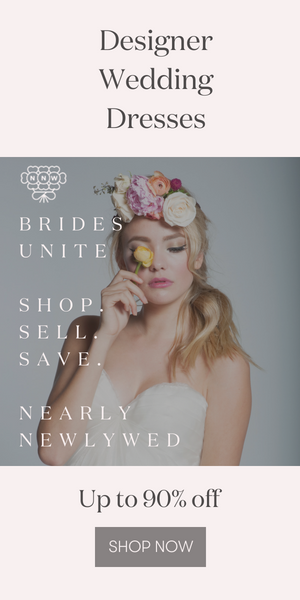 I looked through Anthro’s instagram and pinterest to get inspired, as well as our sister company BHLDN which is our wedding line. I got a lot of inspiration by kind of taking Anthro’s whimsy, mixed with BHLDN’s romance and vintage touches, and added it together with fun, “us”, and happiness. From the bride: I loved all of the unplanned moments. Tim and his mom were finishing their mother-son dance, and motioned me and my dad to join them. Then we told my mom and Tim’s dad to come up to the dance floor too, and we did this silly little ring-around-the-rosy, tarantella, dance together holding hands. It was so special it made my heart explode. Our two families joining together to celebrate our love. From the bride: Our photographers, Christine and Chastity, were so amazing. From the first time we met, I knew they would be perfect for us. They are so humble, sweet, and have one heck of a talent for shooting weddings. I trusted them to do what they do and I am so happy I did! The pictures blow me away, they got every little thing. When I look through the pictures I relive the day all over again. I love how they capture these moments and feelings. They had some pictures for me the next morning that I was able to share with my family and friends, and then had my whole gallery ready when we got back from my honeymoon. I adore pictures and am so thrilled with what they captured. A huge thank you to Goldie & Christine for sharing Kelly and Tim’s sunny, whimsical wedding with us! Love this backyard wedding feel? Head over to this bohemian backyard wedding in Colorado for more awesome wedding design inspiration! Nice couple romantic moment photography very awesome . Those flowers are very attractive to looks.